1 Bring potatoes and lightly salted water to cover to a boil in large pot over medium-high heat. Reduce heat and cook covered until potatoes are tender, about 20 minutes. Drain; when cool enough to handle remove skins. 2 Puree queso fresco, Hellmann's® or Best Foods® Real Mayonnaise, chili pepper paste, milk, garlic and soda crackers in blender until smooth. 3 Slice potatoes 1/4-inch thick. 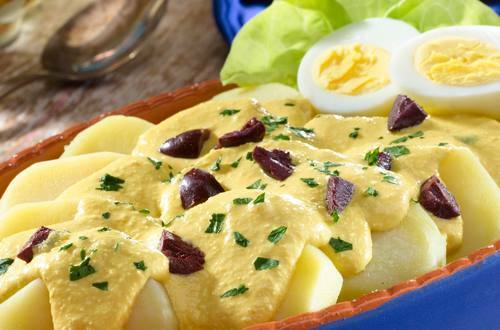 Spoon sauce over potatoes and garnish, if desired, with Kalamata olives and chopped parsley.